"Love this game. Cannot say enough about it. Angela's at it again but this time it's a wedding disaster full of surprises. Lots of levels and hours of fun! You get to create dresses while having fun and catch the zany mouse of course. I finished the game and started over, and you will too. I can never get enough of this series!" Following her successful Queen for a Day Prom Dress line, Angela continues to design dresses to help women be their most Fabulous selves. This time, she’s entering the bustling world of bridal boutiques. When it comes to marriage, all you need is love and the perfect dress. Angela’s relying on you to lend her a hand and make every bride look beautiful on her special day. But the most important marriage of all is for her friend, Fran. Angela and the rest of the Fab-4 join forces to give him the grandest party possible. However, like everything Angela does, things don't quite go according to plan. Can Angela save Fran's wedding from disaster, or will she only make it worse? 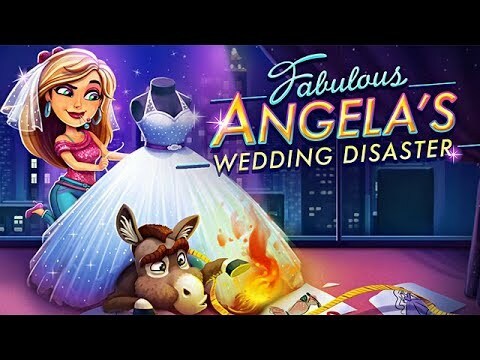 Fabulous: Angela's Wedding Disaster is so much fun and challenging that I find myself playing it for hours and hours. I challenge myself by trying to achieve an expert level without buying any assistance like patience, or bonus points. It doesn't always work out, but that's what makes it so much fun! This is a great game to play for all ages! Fun graphics as well. I have played all of the other games in this series and cannot wait for more to come out. I get excited every time I play another level. I can never get enough of the Angela games. It seems so real to me and makes me feel like I'm really Angela in the game. Give it a try and I bet you can't stop playing. I love this game. Great details! Enough levels to play to make it worth the purchase. It was a very fun and exciting game. I love the plot and I would definitely recommend this to other people who enjoy these games. Very awesome! Very good game. I have played every one of the Fabulous Angela games. Very addicting. Keep the games coming. Showcase the fashion sense of Jojo and Rosalind with their joint line.